This vegan burger uses flaxseed as an egg substitute to hold together the ingredients for these patties. It’s made with ground oats, chickpeas, bell peppers and peanut butter and is seasoned with flavorful Moroccan spices, harissa (a Morocca chili paste) and ras el hanout. 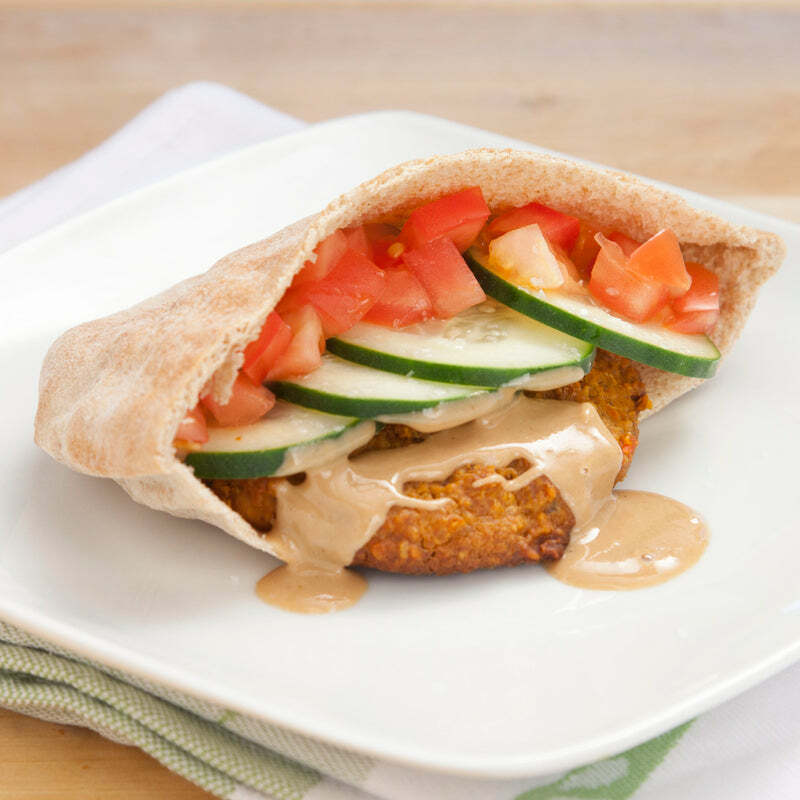 Serve these burgers falafel-style — in pita stuffed with cucumber slices and tahini sauce. * The ras el hanout can be found in specialty food stores and gourmet shops or online at Amazon or Penzey’s. Or you may omit it and just add an extra teaspoon of cumin. 2. Combine flax seeds and water in a small cup and whisk together. Set aside. 3. Place oats in a food processor and process until coarsely ground. Add half the chickpeas, bell pepper, mint, lemon zest and juice, garlic, spices, harissa, peanut butter, olive oil, and flax mixture, and process again until smooth. 4. Transfer to a bowl and stir in remaining chickpeas, and season to taste. 5. Use an ice cream scoop to place the batter onto the prepared baking sheet (about 6 burgers per sheet), and press slightly with hands to form burger-shaped patties. 6. Bake 15 minutes, then use a spatula to gently flip and bake for an additional 15 minutes or until golden and crisp around the edges. 8. Serve on pita bread with fresh cucumber slices, lettuce, and tahini sauce. The post VIDEO RECIPE: Vegan Peanut Butter Chickpea Burger appeared first on - Peanut Butter & Co. Recipe Blog.